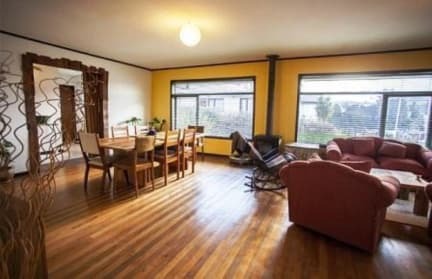 Right in the center of Puerto Varas is the Hostel Melmac Patagonia, a charming property with good vibes and with a free welcoming beer waiting for you. Also, we are proud to offer you our new and exclusive service, a hot tub and SPA. We have just move our location to a nicest house which it has been completely renovated to give you the comfort you are expecting, and in this winter don't you worry about it, we have heating in all our rooms. Meet loads of interesting travelers while socializing at the 'asados', having our own craft beer or over a nice wine in our terrace. We organize all the excursions that you can find in the area without paying any extra. Cancellation Policy : 3 days advance notice. A few private rooms and only one dorm for three persons. If you want to meet new people and you are alone, don’t go. But Nice home feeling living area and good kitchen. We are with 2 and had a nice quite and peacefull stay!